This Straight Line Wall Display features 20 two-sided panels, each measuring 30"W x 40"H. Straight Line display offers a 90-degree viewing angle. 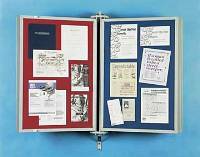 10-Panel Loop Fabric Wall Display with Multiglas™ - 24" x 36"
Model 80-P-20-LM. * For faster shipment of Blue, Black or Silver Loop Fabric with Gray Frames, see In Stock items.